WHO: Boys and Girls U9 (2010) - U15 (2003) Premier and Travel Teams. 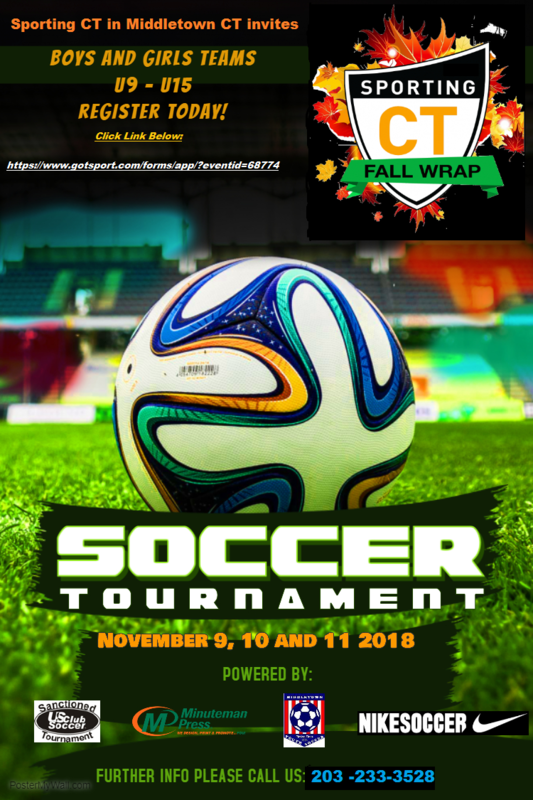 WHAT: An end of season tournament for you to close out your Fall and have fun before the long winter is over. WHERE: Middletown Soccer Fields all within 10 minutes of our 395 Country Club Road headquarters. WHEN: November 9th to 11th, 2018. All participating teams are guaranteed 3 games (2010 & 2009 will get 4 games). The scoring is standard scoring and a complete list of the tournament rules can be found on the application website and www.sportingct.org. Awards will be given for first place and runner up. We would love for you to be a part of the beginning of a great tradition where we can all compete at the end of the season and most importantly….HAVE SOME FUN! !